Club Running traveled to Milton, New York on Saturday, October 21st to compete in the NIRCA Northeast Regional Cross Country Championship meet. This was the first time that the Pride competed at the Regional level and were able to score in the meet. 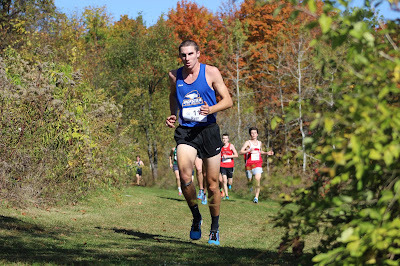 Ryan Connell was the top finisher for the Pride with a time of 29:50 placing 45th overall in the Men’s 8K. Tyler McPartland was the second finisher for Hofstra with a time of 30:22 placing 55th overall. As a team, the men’s team came in 13th overall. On the women’s side, Courtney Gallagher was the top finisher for the Pride coming in 61st overall and a time of 28:59 in the Women’s 6K. Natalie Idone and Victoria Crowley finished 88th and 91st, respectively. Club Men’s Rugby traveled to Poughkeepsie, New York on Sunday, October 22nd to take on Marist College with a Tri-State Conference North Division Playoff spot on the line. Although Hofstra started strong, Marist was quickly able to score two tries and go up 14-0 in the first 20 minutes. Jeremy Tabansi would get the Pride on the scoreboard to narrow Marist’s lead to 14-5, but the Red Foxes would pile on the scoring to extend their lead to 31-5. Jamel Hughes and Josh Beck would add another two tries to draw the Pride closer at 31-17, but the Pride would ultimately fall to the Red Foxes 55-17. Club Roller Hockey’s Division 2 team traveled to Sewell, New Jersey to take on St. Joseph’s University, Drexel University and the University of Delaware on Saturday, October 21st and Sunday, October 22nd. The Pride would come away with a perfect 3-0 record on the weekend, led by Colin Ewald who would lead the team in goals and points over the weekend, recording 14 points in the 3 games. Club Ice Hockey hosted the Suffolk County Community College Sharks on Saturday, October 21st at Northwell Health Ice Center in Eisenhower Park, East Meadow, New York. Austin Natale would open the scoring in the 2nd period with a power play goal off assists by Andrew Gagnon and Darren Schwartz. The Pride would add another power play goal in the 2nd as Schwartz lit the lamp off feeds from Joe Grice and Zach Lamberti to give Hofstra a 2-0 lead at the end of the 2nd period. Suffolk would show resilience as they answered with two goals of their own in the 3rd period to force overtime. However, the Pride would have the last laugh, as Eli Vaillancourt tallied the game winner in overtime off an assist from Schwartz to give Hofstra the 3-2 win. Liam Hartnenstein was brilliant in goal for the Pride as he notched 33 saves. Club Women’s Lacrosse traveled to Fairfield, Connecticut to take on the Stags of Fairfield University on Sunday, October 22nd. Jessie Allendorf had a hat trick on the day, Zoe Szczotka and Lauren Mastrianni had two goals each, and Linnea Barbour, Maddie McDonagh and Kelsey Picciano each had one goal. Mario Lao was solid in goal making 13 saves, but the Pride would lose a high scoring affair to the Stags 14-10. 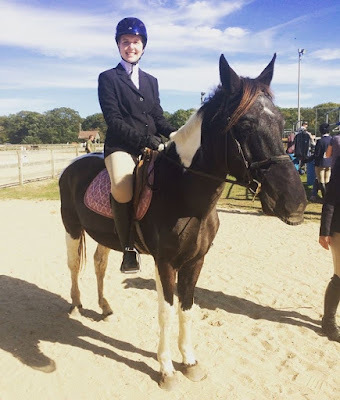 Club Equestrian hosted a show at Country Farms in Medford, New York on Sunday, October 22nd. Petra Srnec placed fourth and Meghan Tierney placed sixth over fences. In flat class, Katie Rozek placed first, Julia Shalov placed third, Victoria Vossler placed sixth and Maya Palmer placed third. Club Baseball hosted Adelphi University at Wantagh Park in Wantagh, New York on Saturday, October 21st. Sean Kaimen was strong on the mound for the Pride and the offense came alive as each member of the lineup recorded a hit in a 10-4 victory. Club Billiards hosted their first open tournament in the Game Room of Hofstra University on Friday, October 20th. Zachary Cedar edged out Tabish Dhsan to take home the tournament title. Club Quidditch traveled to Leonardo, New Jersey on Saturday, October 21st to compete in the Monmouth University Tournament. Hofstra would come away with two wins on the day behind two snitch catches by Robbie Levinson. Club Women’s Ultimate Frisbee traveled to Poughkeepsie, New York to take part in Vassar College’s Huck for Red October Tournament. The Pride would win 4 out of their 7 games and come in third place overall. Kathleen Molski and Xin “Dawn” Li scored their first ever goals for Hofstra. Club Women’s Soccer traveled to Hoboken, New Jersey on Saturday, October 21st to take on Stevens Institute of Technology. Stevens would score within the first ten minutes of the game to take an early lead, and the Pride would ultimately fall to the Ducks, 2-0. 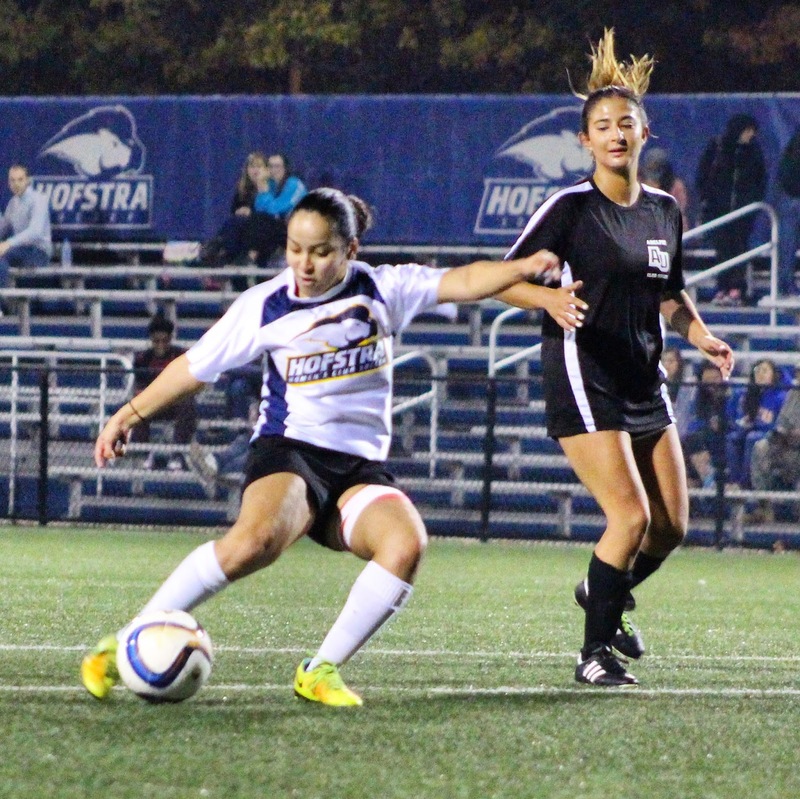 On Sunday, October 22nd, the Pride were back on the pitch as they hosted the Panthers of Adelphi University at the Hofstra Soccer Stadium. Neither team was able to find the back of the net, as the teams played to a 0-0 draw. Club Climbing traveled to the Gravity Vault in Melville, New York on Saturday, October 21st. The team had another good showing and all had fun on another weekly club climb. 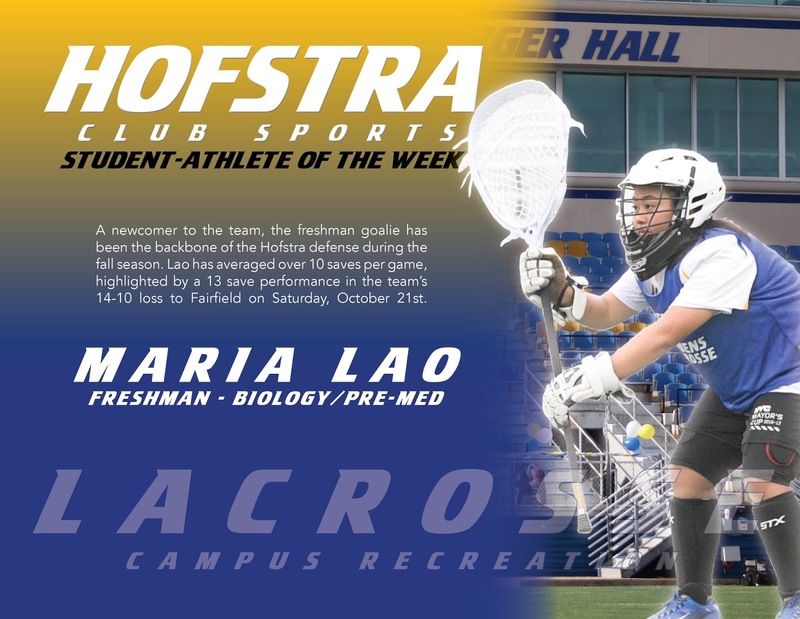 A newcomer to the team, the freshman goalie has been the backbone of the Hofstra defense during the fall season. Lao has averaged over 10 saves per game, highlighted by a 13 save performance in the team’s 14-10 loss to Fairfield on Saturday, October 21st. Congratulations to Maria!